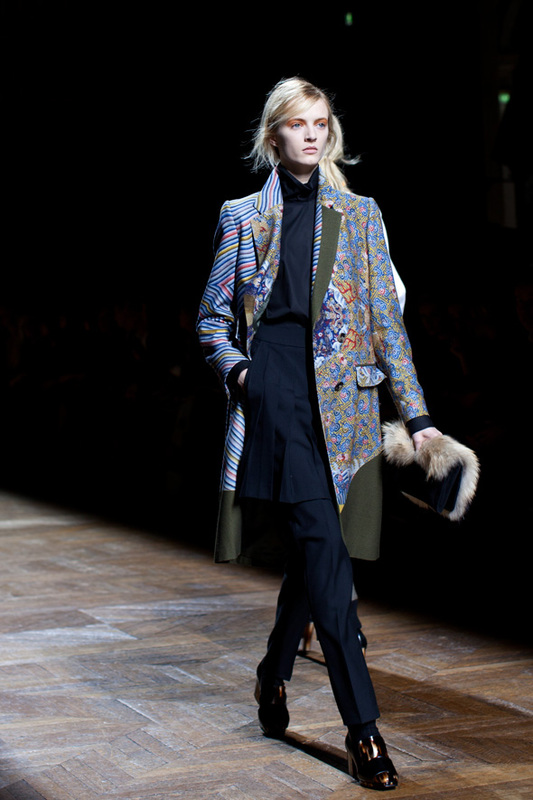 Dries Van Noten + Oriental theme = PERFECTION!!! After looking over this collection over and over, I have decided my favourite piece is the simple dark navy silk blouse, with the half-embroidered sleeves. 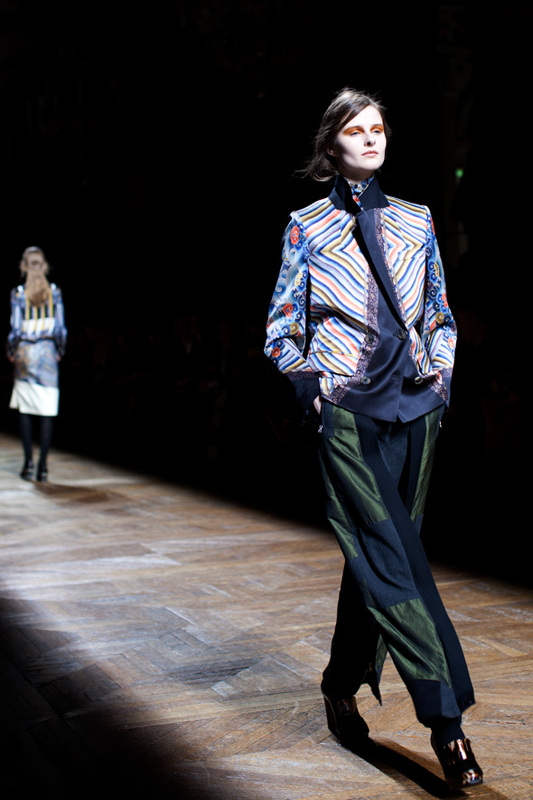 Dries Van Noten found his inspiration at the V&A museum, taking pictures of the archives, and making collages of some of the oriental/Chinese prints. But my favourite pieces were mostly the gorgeous outerwear, like the jacket/outfit in the second picture below, as well as the coat below it (pretty much all the coats and parkas in this collection). Look at those shoes! Love the 'plaques' on the skirt! Love this jacket belted with a peplum effect...absolutely gorgeous! Hmmm.... What could be Ms B. 's fav collection of all?? ;) What a picture heavy posting, gorgeous! :-D And indeed, the collection is truly amazing. The embroideries are in one word marvelous! 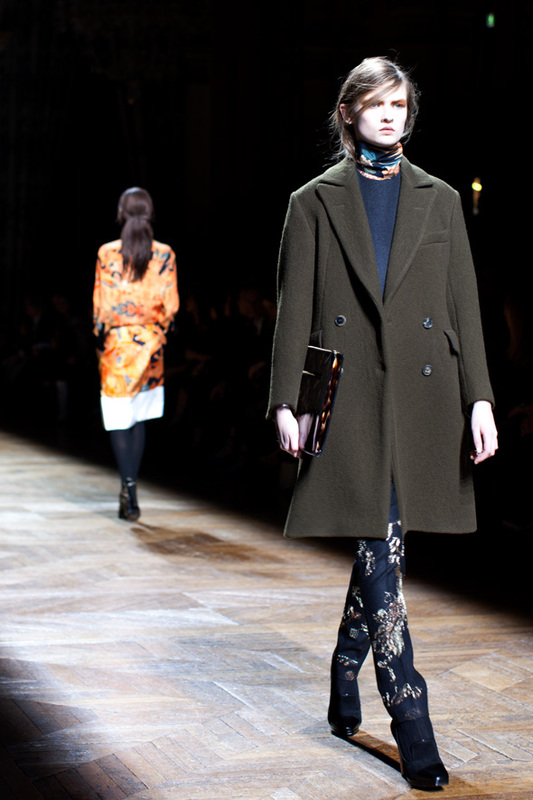 The dark blue jacket and dresses - the military green jacket with large collar and fur. Also the multi-colored/patterned dresses are just beautiful! I wish you all the health (and happiness) in the world for you! Gosh,... that jacket with the embroidered bird is so amazing! Love the white skirt with the print and there is another simple black skirt I so adore!!! The prints and the details are gorgeous, love the Asian inspiration for this collection !